I prayed to the patron saint of cooks and servants and my wish was granted. Saint Martha heard my plea for a unique, delicious meal and she took mercy upon me. We ventured to Koreatown and parked in an unprepossessing strip mall. We approached with trepidation as the place had no windows, although an enticing red door beckoned. What lies beyond…? Magic. 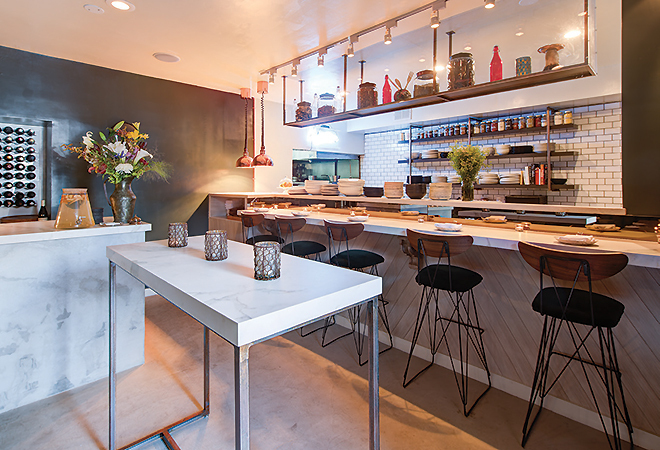 Saint Martha is a tiny 38 seat establishment that creates delectable works of art. 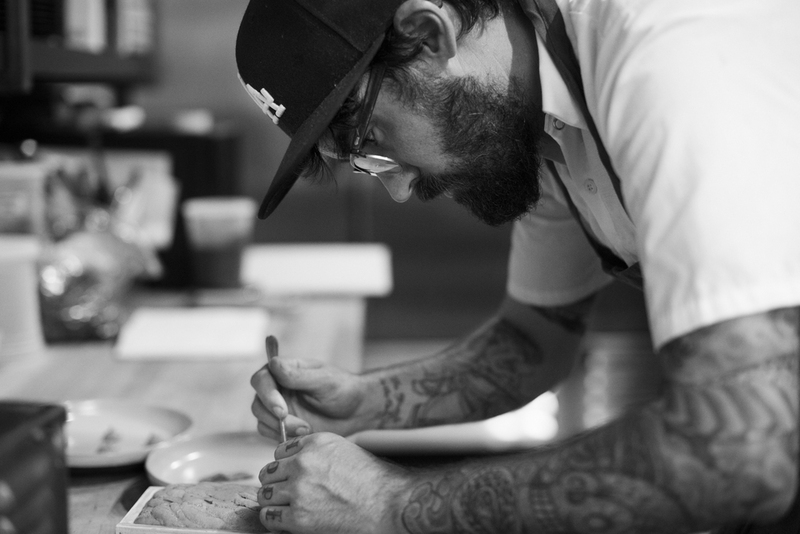 Chef Nick Erven is cooking Modern American cuisine rooted in European tradition. 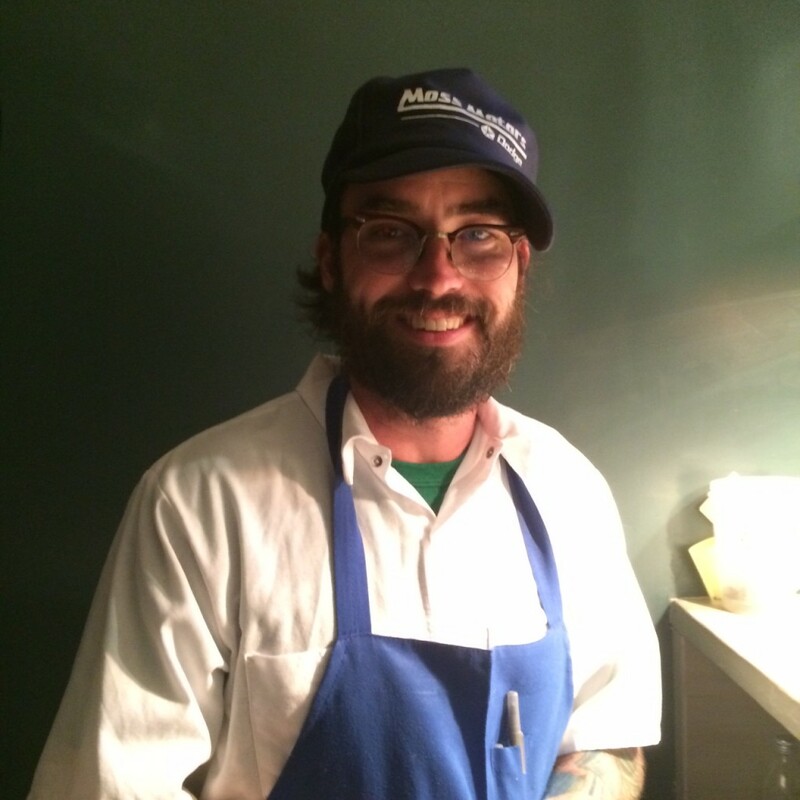 He is a welcoming, personable chef with a youthful exuberance. 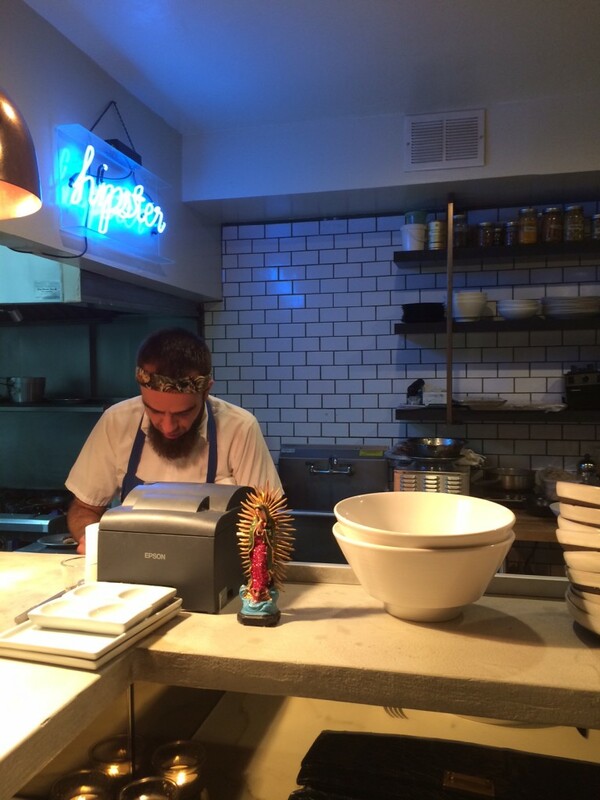 Erven oversees every single creative dish that leaves the kitchen. Saint Martha, which opened in June, is founded by Peter and Ellen Picataggio of TART and helmed by Chef Erven who was the chef at TART. He credits Chef Seth Greenburg, with whom he worked for many years at the Penthouse at the Huntley Hotel in Santa Monica, as his main influence and mentor. Sous chef, Garbriel, runs the kitchen wih a firm, but friendly grip. He also hails from the great state of Connecticut so we dissed about the restaurants and lack of great food, although the restaurant scene in Connecticut is gradually improving. General manager and sommelier, Mary Thompson, has put together a list of 50 underappreciated wines by taste, glass, piche and bottle. 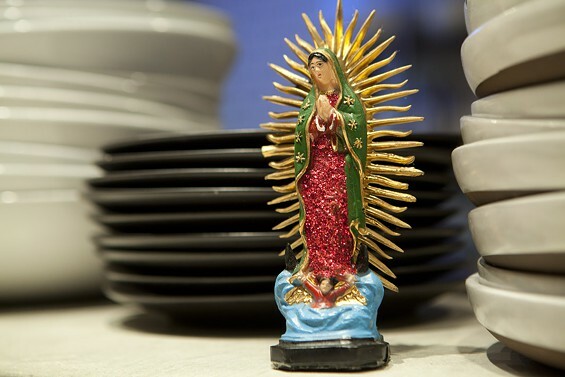 Mary is a marvel and was sommelier at Rivera in downtown Los Angeles and NYC’s db Bistro. Every single staff member including our waiter, Roderick, was gracious, friendly and competent. 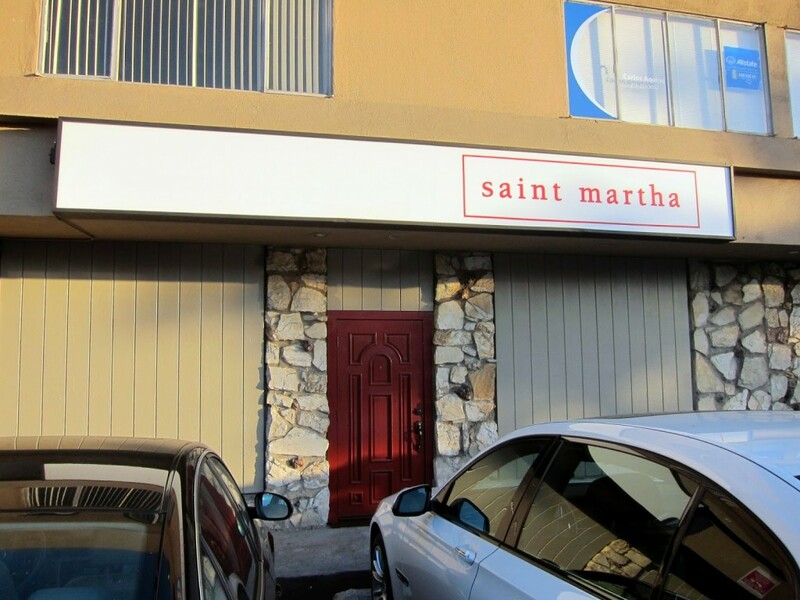 Comfort, divine food and good peeps…blessed be Saint Martha. We had the option of sitting at the bar that fronts the small prep area or residing at a table. We chose the up front and personal positioning. We kicked off the evening by selecting a syrah/grenache from the extensive wine list. Michel Chapoutier Cotes de Roussillon France 2012, a vibrant velvety blend. As noted, the wine pours come in four sizes. We chose the piche ($28 for 4 pours). 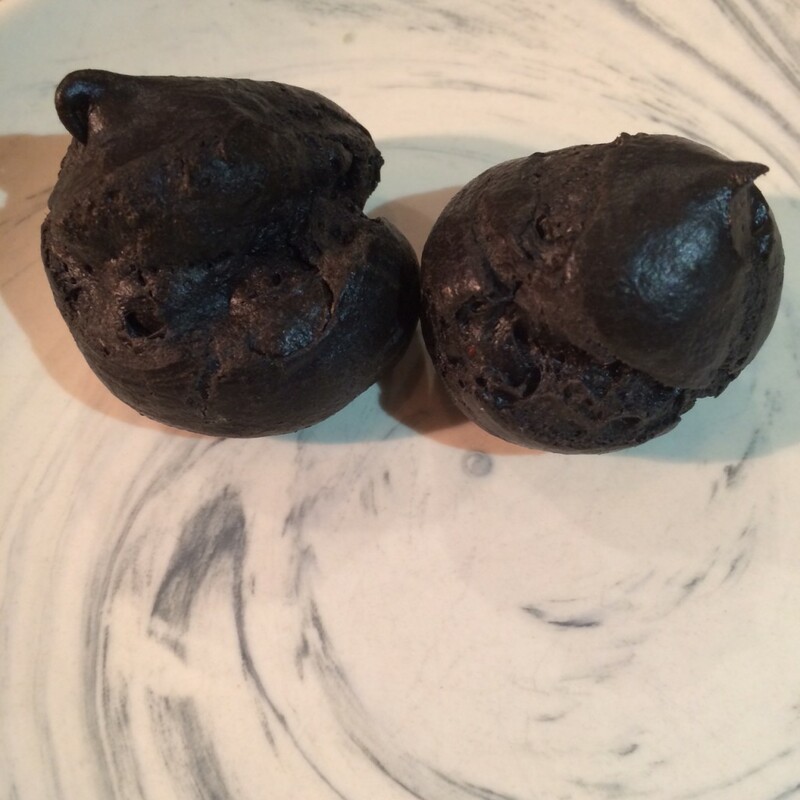 Chef Erven sent over squid ink gougeres that were jet black and tasted decadently divine. Funny, gorgeres must be au courant as I had some gooey, cheesy ones at Brooklyn’s Dover Restaurant two weeks ago. 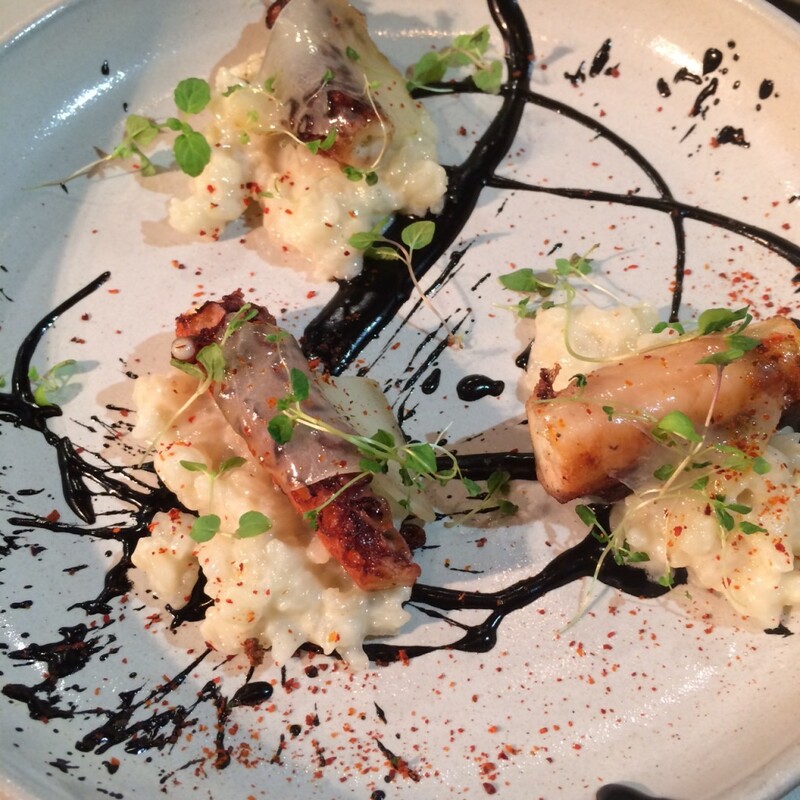 We started our culinary journey, selecting from the “Snacks” column with the Octopus with Koshihikari rice, sauce nero, lardo and espelette ($13). The octopus was tender and flavorful the rice mouthwatering. We wanted to sample the crab and smoked uni cream “okonomiyaki” ($12), but it had been completely consumed before our auspicious arrival. 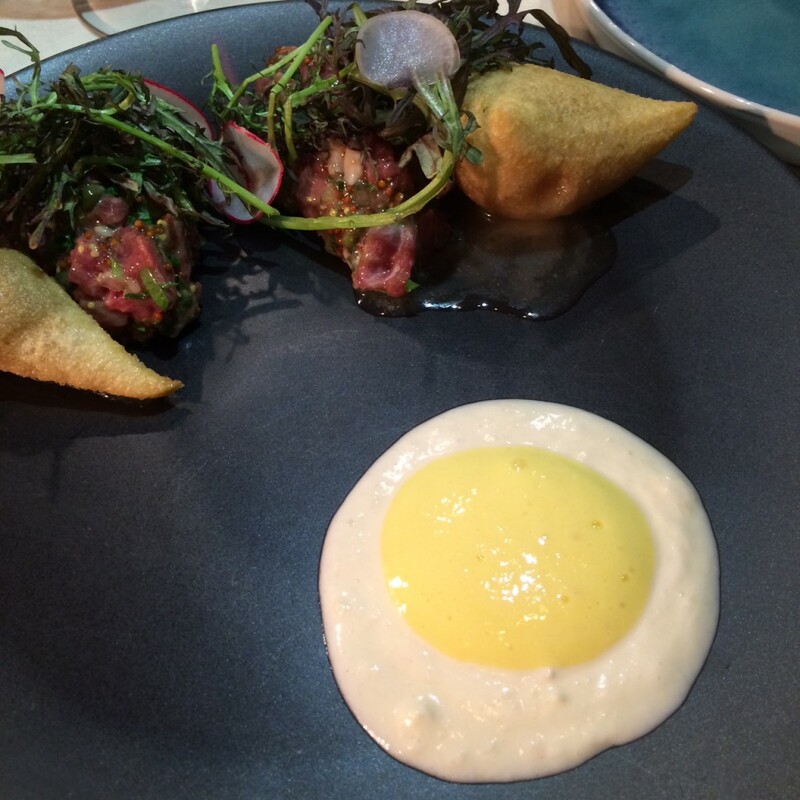 Under the “Rawesome” category I had to try the steak and oyster tartare with champagne sabayon and bone marrow beignets ($15). The horseradish creme was formed to look like a sunnyside egg. The tartare was tangy and delicious. The bone marrow beignets were unique and truly amazing. 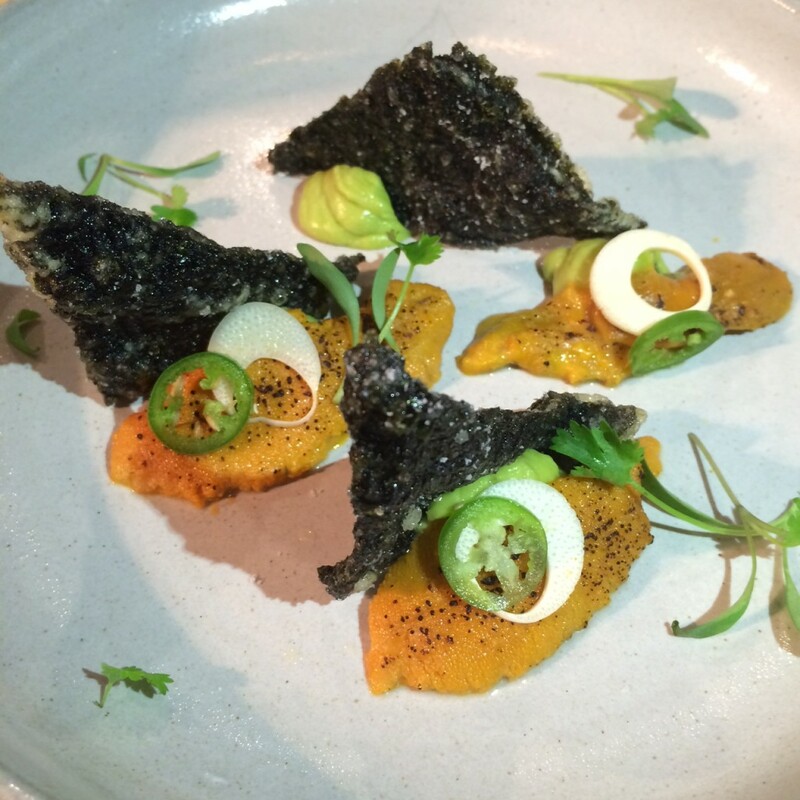 The next course also fell under “Rawesome”…sea urchin tataki with avocado mousse, hearts of palm and seaweed doritos ($14). The dish was tantalizingly creamy and the chips were addictive…a take on guacamole and chips. 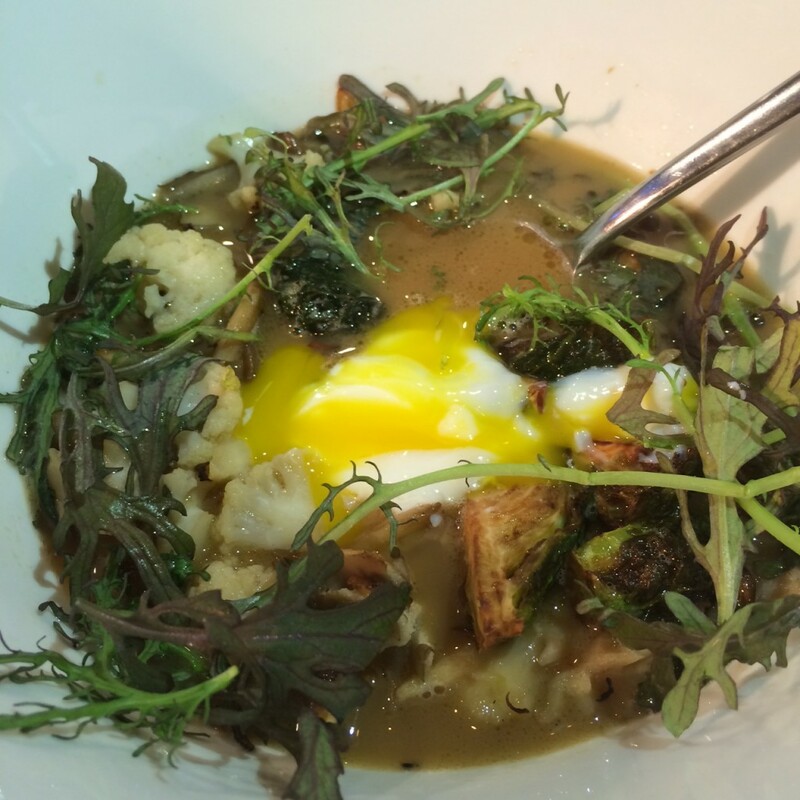 I asked Chef Erven what to order under “Vegetables” and he recommend the Brassicas with brewer’s yeast broth, mushroom and egg ($13). The dish is unique as well as fantastic. Brassicas has given rise to cabbage, Brussel sprouts, broccoli, Chinese broccoli, kale, collards, and cauliflower. The “Fish and Such” column listed a house recommended Pan Roasted Snapper with beet greens, bacon and cipollini ($23). 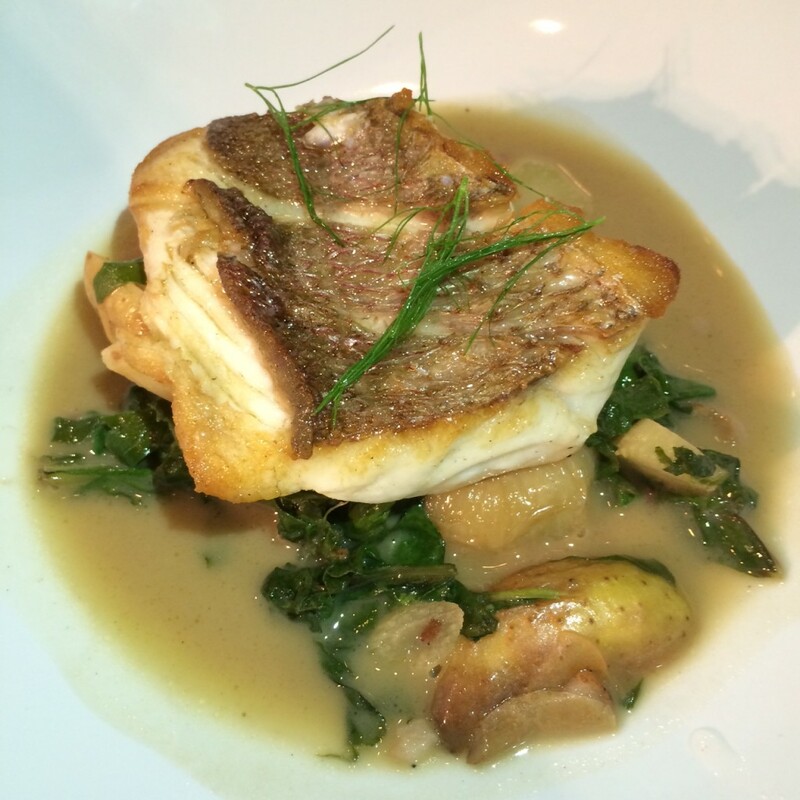 The fish was prepared perfectly with a lovely sear, delicate flavor and the vegetables were a savory accompaniment. Also on the menu Diver scallops with mushrooms, smoked kombu, caramelized endive and white yam puree ($22) and Idaho trout with green goddress, dill, purslane, beets and fennel ($20). The reviews on the brisket in the “Meaty Things” bracket have been over the moon. I saw several pass by. Out of the blue, Erven graciously presented us with a full order. 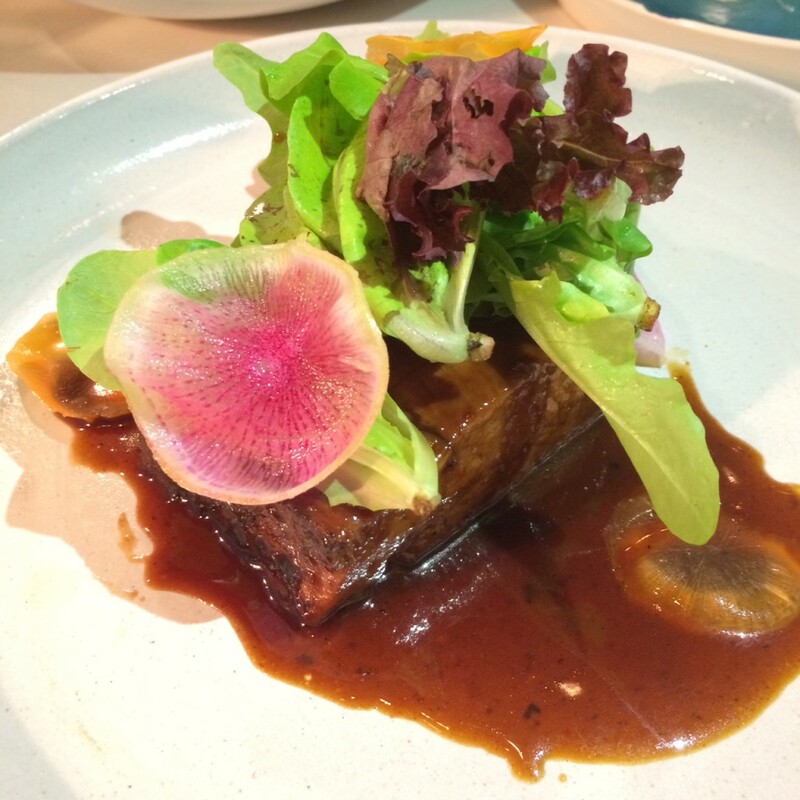 The pecan wood smoked brisket with chili-hoisin, lettuce and shaved root vegetables ($22) is indescribably delicious. The brisket embraces a 14 hour cooking process. When I tell you that it looked gorgeous and tasted even better…believe me. It is worth the trek to Koreatown just for the tender, buttery brisket. I could not eat even half so they made me a silver foil duck and we journeyed home together, I heated it up after the NY Giants devastating loss and it was the only positive thing on a defeated Sunday afternoon. Dessert was out of the question…next time for there will definitely be an encore. Do not ignore the Chef’s Pick of a 5 course $65 menu (wine pairings for $36) or the 7 course option at $90 ($47 wine pairings). I genuflect at the culinary pulpit of Saint Martha. The food is beyond wonderful, the staff and chef beyond gracious and friendly. We adored the intimacy. Note: it was very warm so if you are a hot number or menopausal, dress for summer. Sounds phenom! Please take your amazing daughter with you next time.